It's not often you learn a new word at my age, but here's one: halteres. You can see a couple in this picture of a Daddy Long-legs or Cranefly, the first of its kind ever to make this blog. Huzza! They are the little appendages with a knob on the end, like a Morris Minor gearstick, poking out on either side of the insect where its hindwings would be, if it had them. Aeons ago, daddy long-legs had hindwings, as dragonflies do, but they evolved into halteres, which are best described as flight guidance instruments. Through vibrations, they send messages to daddy long-legs brain control, and keep the insect on course and the right way up etc. Mind you, I wouldn't want to rely on them in civil aviation. Have you ever seen a daddy long-legs in flight? Harking back to my Airfix kit days, it compares with your average fly in the same way that a Lysander or German Stork plane did to a Spitfire or ME109. if you click on the pic, it will come up much bigger. I took my second picture on an excursion up to my tree house, which I am getting ready for a visit from Ian Mayes, who is writing the latest history of the Guardian. The connection is, that panelling from the old Cross Street head office, which the London paper did not want in its general abandonment of all things Mancunian, now forms part of the tree-house's top floor. This was originally called the Isles Skylounge, after some neighbours who kindly donated me some fake stained glass windows, but it is now the C.P.Scott Room in honour of our greatest editor. I must now email Ian putting him off for a few weeks, because a pair of wood pigeons have chosen to nest right outside the tree house's first-floor windows and the mother got into a terrible panic when she saw me. Rain and moths don't mix. So the trap is tucked away 'til the weather settles down. The rainshield is brilliantly effective at protecting the bulb (and therefore my wallet) but it doesn't stop water getting into the bowl and that would mean death by drowning for at least some moths. Never fear, however. The subject of entomology is seldom out of the news. Normally it's a case of scaremongering articles about species extinction, but last night was the turn of the Wonderful Butterfly Dresses of Belarus. Much-flagged in advance, their appearance in the Eurovision Song Contest was brief, but then so is the life of a butterfly. They 'hatched' on the girls at the end much as the wings unfold from a broken-open chrysalis (an experience which everyone should see at least once in their lifetime), and they were lovely. They didn't however save Belarus from coming second to last in an epic which Germany deservedly won. Guess who came last, if you don't already know. Yes, the good old UK. I am not a very good judge of these things, but I had the impression that our guy couldn't even sing, although Penny, who is an outstanding member of Horsforth Choral Society says: "A lot of them can't sing, so that isn't anything unusual." (She also says with characteristic kindness that it must be very difficult in front of an audience of 18,000 people, which the HCS seldom attracts). A footnote to butterfly-themed clothing, and another guessing game: who wore a butterfly waistcoat at his older son's wedding last year? Yes, ME! I would really have liked a Belarus-style jacket but it isn't done to attract too much attention from the bride and groom, and I was very satisfied with the handiwork of Stitchy-Witchy, the finest seamstress in Shipley (49 Bradford Road, Shipley, West Yorks BD18 3DS). Here it is, and if you click on the pic you can observe details such as the spindly body (the butterfly's, not mine) and - if you look very carefully - the sewn antennae. Electorate 76231 Votes cast 38,242 (50.04) Postal votes cast 9991 (26% of the total). Here are two cousins, or possibly even brother and sister, both of them Scalloped Hazels in spite of their very different colouring. The dark one is the form Nigra which occurs in small numbers in an interesting range of places, not just those associated with pollution, past and present. Does this mean that it is melanistic, as in the famous example of the Peppered Moth whose dark version has declined with pollution (and in inverse ratio to the national improvement in health as evidenced by the number of people getting 100th birthday telegrams from Buckingham Palace - see previous posts)? Or is it just a different colour pattern which has arisen for other reasons? Observations welcome, and I shall enquire more widely too. this particular one looks to have had a brush with a bird or bramble, judging by the streaks along its wings. I had an exactly similar visit from two different Scalloped Hazels two years ago, so there is a small contribution to the recording system. Also visiting, the first of this year's Flame Shoulders, an instantly-recognisable arrival and therefore warmly welcomed by all of us who cannot tell our Pugs and Carpets apart. The trap's biggest regular visitor, by some margin, has arrived: the Poplar Hawk. It is quite a feat for these insects to conceal themselves during the day and fly un-noticed at night. You can see the disparity with the little Red Twin Spot Carpet (Sorry, Flame Carpet - see Ben's Comment) in the photo above, which also shows the hawk's unusual habit of resting with its forewings behind its hind ones. Moths this size keep up my spirits, as a dilettante observer, after nights when everything which arrives is small and brown. They should be here for a while now; looking back through the blog, I see that they visited well into June in 2008 and last year. Two years ago, the somewhat smaller but much more vividly-coloured Elephant Hawk also paid a couple of calls but there were none last year. I live in hope. Poplar hawks are very docile after a night in the trap and sleepily accept transfer on to sprigs of plants in the interests of photography. If you look back to June last year, you'll find a pair of them posing on a bamboo cane, perfectly aligned like a dancing combo. Penny and I have been away for a long weekend to mark our joint 120th birthday - in Nice, which is well-named. Moths weren't my priority but I wonder how they get along with the city centre's unusual nightscape which includes seven of these large illuminated figures, perching on slender metal poles like St Simeon Stylites. The daytime butterfly world was dazzlingly sunny but I didn't see anything unusual, just some Speckled Woods gambolling in the dappled light on the old castle hill plus what looked like an over-sized Orange Tip. There was also this butterfly-themed advert in the window of a dry-cleaners (left). The use of butterflies and moths in advertising, and culture more widely, always interests me, and I was grateful for some good examples when I sounded off the other week about National Moth Day on the Guardian's website. They were given by readers in the article's thread, like so many enterprising little clothes moths browsing on this piece of cyber-fabric. Goodness, what similes; the sun must have got at me. So finally, here is the only butterfly I managed to photograph in Nice; a slightly worn female among lots of beautiful Blues skittering about the very impressive Roman ruins below the Matisse museum (all civic museums are free in the city and there are plenty of them - vive la France!). I don't know precisely what type of Blue she is, but she looks like a Common one - proof yet again, that beauty is not confined to fine breeding. By chance, my two illuminated men were blue when I snapped them; they change colour all the time. There's not a lot left of this gallant old Small Tortoiseshell which must have had an eventful life. It will have hatched last August, I guess, and survived since then in the beautiful surroundings but often bracing climate of Grassington, where Penny and I found it on Cove Lane, on our way back into the village from Grass Wood. The sunshine brought out plenty of other butterflies - Speckled Woods, Orange Tips and Green-veined Whites and it was also great to see an Oystercatcher powering its way along the gravelly curve of the Wharfe. They have fine beaks! Back in the trap, it's Littly time, which always drives me mad in terms of identification. I'm pretty sure the blurred one is a Dwarf Pug and the prettily-patterned percher on the trap's plastic cowl, a May Highflyer. The third is one of the carpets, I'll hazard, but I have to get up now to do some work. I'm hopeless at arranging text and pictures when I've got rather a lot of the latter, so apologies that this post looks a bit of a dog's breakfast. Oh and thanks for the Oystercatcher picture to the website www.discoverislay.com. Discovering Islay is a good thing to do. There is no way I'd ever have got a picture of ours in flight, but too much faffing with the camera can spoil the moment, so I don't mind. A lovely day, a lovely walk. Penny and I marked my extreme age by meandering from Grassington via Linton Falls and the Wharfe bank, through Grass Wood and back again to the village for tea. Many decades ago, my Mum took my brother and sisters and me to Grass Wood to see the wild Lily of the Valley. They were sparse then but have prospered and are abundant this year, one of them providing a boutique hotel for this Daddy Long Legs. The reason is that the excellent Yorkshire Wildlife Trust is gradually restoring the wood after years of misguided management, and has very good notices explaining its thinking and asking us all to be patient, as the full effect will not be seen for 200 years. The way that genetic replacement of our failing body parts is going, I look forward to that. One of my cards said: "You say you're still-middle-aged..." and the inside "How many 120-year-old do you know?" Ha, ha....err, hum. At home, the trap produced this handsome Lychnis; at least, I'm pretty sure that's what it is, although there are a number of moths which look annoyingly similar. One of them has the nice name of Pod Lover, but I think that's too rare to be this moth. If it is a Lychnis, it is out early for the North, but that would accord with the number of species that seem to have moved our way since my Waring & Townsend & Lewington guide was published in 2003. Other candidates include assorted Rustics, Minors, Brindles and Brocades. So you can see that I'm covering myself, but I'll stick with Lychnis and wait for your more expert views. Yippee, it's my birthday when I always hope that something good will happen. It usually does - last year, for instance, on my younger son Olly's birthday, the most magnificent Large Emerald came to the trap. I've already had one present: the Pocket Handkerchief tree (Davidia involucrata) which we've had for years has flowered for the first time. 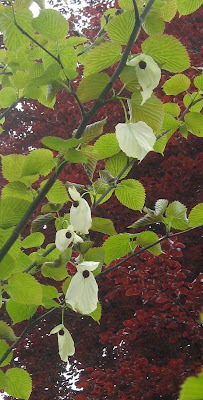 Here are some of the bracts - the hankies or ghosts which give the tree its other name. We collected a seed at Bristol Zoo with a favourite aunt and uncle, put it in a pot, forgot about it, found a weird spike with a solitary leaf a couple of years later and planted it out. That was ages ago but it's been worth the wait. More maybug merriment. There were 15 in the eggboxes this morning and this quartet landed upside down when I was sorting rather dozily through. In the callous manner of nature observers, I sat down to see whether they could right themselves and, if so, how long it would take. They did, in this first case in 47 seconds. The method is to waggle the legs methodically to tilt the centre of gravity, maintaining the movement in a disproportionate way (I couldn't quite work out the mechanics at this early hour) to increase the momentum until the tilt allowed an outstretched leg to get a hold. It was then used as a lever, followed in quick succession by others. Bingo! The whole process was methodical and done without panic. I suspect that maybugs fall on their backs quite often. The arrival of this daft-looking creature, the maybug or cockchafer, always makes me smile. You couldn't make its appearance up. This one was much too dozy to fly but when they do, they cannon around like demented rockets. I wonder why they developed such impressive armour and so intimidating an appearance. There is any amount of entertaining information on cockchafers, which were one of the most obvious pests in simple farming times. They were put on trial in mediaeval France, used as toys by children (some of whom may have become entomologists...) and eaten in various startling recipes, one including sugar. 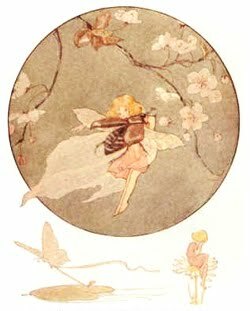 My favourite reference is Thumbelina, where the lady cockroaches sit around discussing how ugly Thumbelina is - " Why, she has not even more than two legs!—that has a wretched appearance." " She has not any feelers!" cried another." Her waist is quite slender—fie!" In his gentle way, Hans Christian Andersen makes his valid point about beauty and the beholder. Otherwise things continue very quiet, but at last it is getting warmer. Here is a pug - I'm assuming a Brindled one, because most of them are at this time of year - adopting a 'butterfly pose' as they do when disturbed. The cockchafer certainly can't so this; its wings lie concealed and folded under its armour-plated wingcases, although a little scrap was sticking out above the tail of mine, like someone who hasn't tucked in their shirt properly. Lat night was National Moth Night, apparently, which seems to me an unwise choice of date. There are not that many moths around in mid-May and the cold spell has further reduced their numbers - as indeed my postings here. The organisers, various bods including - I'm sorry to see - Butterfly Conservation, flagged the event with journalist-tempting data about moth numbers 'tumbling by a third' in the last 40 years. Poor results will perhaps appear to bear that out but (as faithful readers may not be surprised to hear), I am sceptical about this gloom. When I have time, I will try to find out more but in the meanwhile, if my learned and faithful pals like Phil and Ben are reading this, I'd be very interested in your views, and indeed anyone else's. My particular worry is that well-meaning, Guardian-reading etc households will have mobilised their children into moth frenzy, and everyone will have ended up disappointed. Let's have another go, in June or July. For my own part, I have only used the trap intermittently while it has been so cold, and the arrivals lounge has been almost as empty as a British airport's during the volcanic ash-spew. The other night there were three Brindled Pugs and a Hebrew Character. Last night, one Clouded Drab and this nice Shuttle-shaped Dart (above left) - more details on that particular moth several posts below. Penny meanwhile continues to cover herself with entomological glory. She found this chrysalis in a towel brought back by our younger son from Croatia last year and left folded-up in the garden shed. It is now sitting in our warm kitchen, under constant scrutiny during what I have unilaterally declared to be National Chrysalis Month. The bootlace at the top, in case you are interested, is my temporary dressing-gown cord. Thanks to the continuing chill, and now damp, the moth trap is mothballed (ho ho), but Penny is more than making up for its absence. 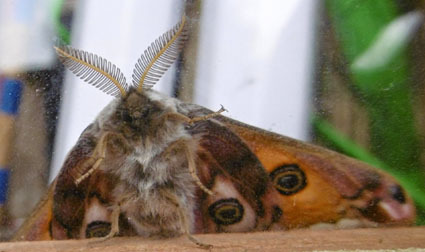 She has become Chief Mothspotter of Leeds, and in the most unlikely circumstances. We went for a walk yesterday in Whisperdales, a lovely little valley inland from Scarborough protected against too many visitors by dreary approaches through 'industrial' Forestry Commission plantations. We had a picnic in the sun by Whisper Beck and as we left, Lo!, P spotted this Clouded Drab nestling in a fold of her anorak. The big, and unanswerable, question is: did it creep in from the mixture of primroses, violas and cowslips on the mossy bank where we ate the finest produce of Thomas the Baker's, Helmsley? Or did it come with us from Leeds, thus adding a tiny chapter to the endlessly fascinating story of species distribution within the British Isles? Whichever, its future lies in Whisperdales now. Back home, P discovered this Brindled Pug on our washing machine. 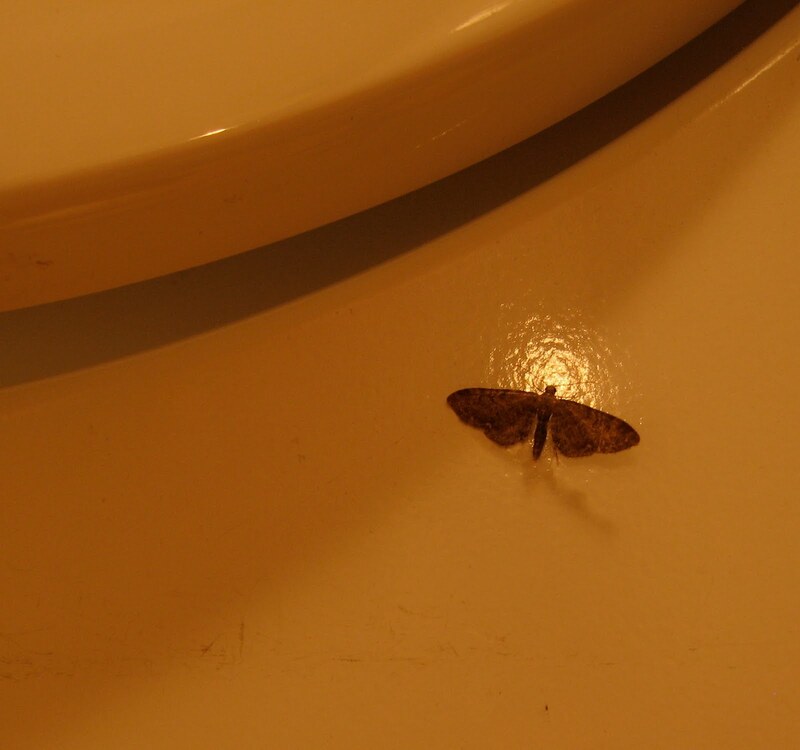 As you can see from its halo, it is also a Holy Moth. That reminds me of Maid Marian on children's TV which used to have us in stitches when the boys were young, especially the episode involving the Holy Hot Waterbottle of St Charlene. Still, there are people who believe these things, so maybe our little moth portends good. A glorious reign of what looks like our coming coalition government? Both our Sainsbury's and my Mum's are in Liberal Democrat seats now - Bradford East and Leeds North West. Their car parks are radiant in the New Dawn and their produce positively glows. Nothing much in the trap this morning apart from this very handsome Early Grey, so I will post my Election Moth a couple of days early to give you time to think. It's another of Penny's finds, a more-or-less mummified Large Yellow Underwing which ended its days on a window-sill and then got stuck in a niche in a battered old wastepaper basket which I brought back as a souvenir from China 25 years ago. Mind you, he's safe as houses in Nottingham North, where it would take a truly seismic rebellion by moth enthusiasts to install a Lib Dem or Tory. As for Michael Gove, he may be our next education secretary, a job with great potential for encouraging young entomologists. He's equally unlikely to be overthrown in Surrey Heath. Anyway, whatever your views please VOTE. It's nonsense to say that it doesn't matter, or they're all the same. The cold is putting off the moths, but each night still brings an interesting newcomer. Here is the Shuttle-shaped Dart, a welcome resident because its caterpillar eats dandelions. Not to much effect in our garden, mind, but still I like dandelions. It's just that you have to control them, because like brambles they have a genetic impulse to take over the world. The Shuttle-shaped Dart has differing colourways for male and female; this one is a male; the female is more brown. I've been checking back through my records to 2004, when Penny gave me the moth trap for my Birthday (May 18th, please make a note; although Blogger doesn't need reminding; each year it automatically adds on). That year, a Shuttle-shaped Dart came on only the second day of trapping, 24th May, and again for the next two nights. Its been an occasional visitor every year since; if I can find time, I shall scroll down the blog looking for it. I like the wing patterns, albeit within the mothy spectrum of greys and browns. Shuttles (below the kidney-mark in the bottom pic) are an icon of this part of the world - still. Don't let people tell you that Yorkshire textiles are defunct. The specialist sector is alive and well as you can read in True North (see my books link above left and please forgive plug). Another pretty visitor last night, but not to the chilly moth trap. Penny spotted this one on the landing, where it then flew up to the ceiling, leading to undignified scenes. I was on my way to the bath, but managed to manoeuvre the camera close enough to get a not wholly-blurred pic. It looks as though the moth is crossing the Sahara but that is something to do with digital photography and artificial light. Our ceiling is not that custard yellow. The moth is a Twenty-Plume, an exceptionally delicate micro-moth, ie not included in the main British list because it is simply too small for the ordinary observer to cope with. That includes myself, except that the Twenty-plume is so distinctive that it ought to be up there with the Early Greys & Co. This one has hiberated and is thus a bit tatty, but the patterning is still fine. Linneaus' botanists called it Alucita hexadactyla, meaning 'six-fingered gnat' in an unusual combination of Greek and Latin. I find it difficult from the moth, and picture, to work out who is right. Are there six plumes per wing, or five (thus making twenty in all)? I persuaded it to pose under my bedside light for the more detailed picture, but still can't be certain. It was cold last night and when we got back from watching The Ghost, I nearly didn't bother with the trap. But I'm glad I did, because delicate, spindly - even ghostly - Emmelina came along. She (or possibly he, it has to be said) was one of only six moths among the boxes. The others were four pugs and a solitary Hebrew Character. Cold weather makes a very big difference at this time of the year. Emmelina's full name is E.monodactyla (or one-winged) and she has the stringbag look of the sort of aircraft my Mum's father flew in the Royal Flying Corps. Unlike SE5As, however, her (or his) wings roll up when at rest, like a window blind. This must be handy in wet weather and it gives the moth its T shape. Some people call them T moths and they are also part of the family known as Plumes. Posied on the edge of a second egg box, here is a Brindled Pug, wondering whether it's worth the effort to flutter over to the primroses. Actually, I think it's asleep. Which reminds me; time to make P's morning tea. PS A bit of self-correction after doing Sunday's post, above. Dactyl comes from the Greek for finger, not wing. Apparently in mythology the Dactyls were small phallic-shaped beings who accompanied the Earth Mother goddess Rhea. Hmm.